The unearthing of the chemical drums under the Okinawa soccer field near Expressway off ramp No. 4 came as a big surprise to local residents on Okinawa. At first the newspapers such as the Okinawa Times and Ryukyu Shimpo sensationalized the subject, assuming the chemicals inside these drums contained Agent Orange which was used during the Vietnam War. The Okinawa Defense Bureau of the Ministry of Defense tested the drums unearthed and the soil from the land adjacent to the Kadena Air Base fence line. 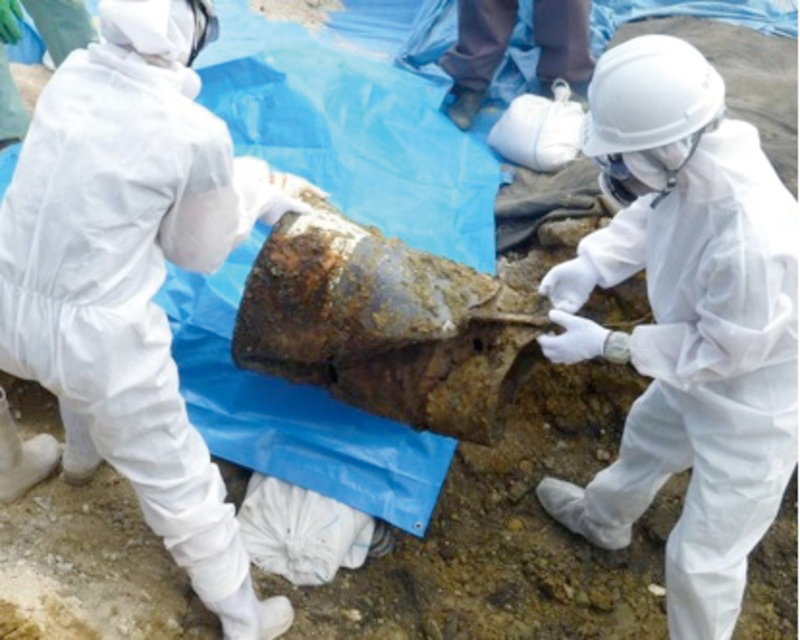 Japanese Defense Bureau remove barrels from Okinawa Soccer Field. The report summarized that, “there is no evidence that the drums contained Agent Orange”. The US Air Force released an English translation of the Okinawa Defense Bureau Report, which was translated by the Okinawa-based company Okinawa Translator. The report is available on Facebook and the Kadenaaf.mil website. Agent Orange is made up of two major components; the chemical compounds of 2, 4-D butyl ester and 2,4,5-T butyl ester, mixed at a 50:50 ratio. Some of the drums found contained 2,4,5-T and 2,4-D; however, it doesn’t mean Agent Orange was found as these two base ingredients are common in pesticides widely used all over the world. To create Agent Orange these two chemicals also must be mixed with other types of solvents. As stated, to create Agent Orange the ratio should be 50:50, but what was discovered was that there was much more 2,4,5-T leading officials to believe that these were assumedly meant for herbicide. Other types of chemicals were discovered such as gasoline, fossil fuels, insecticide, DDT and polychlorinated biphenyl. The traces of dioxins found were below environmental standards, but the Mayor of Okinawa City is not taking any chances and is planning a deeper excavation to confirm there is no contamination. Thankfully, on the US bases on Okinawa, drinking water does not come from ground water. It comes from a Japanese commercial source; therefore, all drinking water meets the US Environmental Protection Agency standards. So for now, all seems clear. The drums were deemed free of Agent Orange, and local residents can all breathe a sigh of relief.